Praise all holy - we got permission from the home owners association to move the bus to Ryan's house for OME WHOLE MONTH!!! By golly this is great news indeed. This is really how it was intended to be from the start - wood shop and all the tools needed will now be only five feet away from the Gillig. Here is the catch though - originally thinking that this would be the arrangement from the beginning, I alotted myself three months to finish the work, now we have to do it all in one month! Those of you who have followed the progress on here may think that we are making good progress... Or you may think that we are dragging our feet - neither are really true in my humble opinion. I think we are really doing better than we could be doing considering the huge monkey wrench that the while parking-off-site-situation has been in our operation. A lot got done, but more importantly a lot more is planned and now that we will have 24 hour access to the bus I feel a wave of activity coming on. Now the goal is to get the first floor done with all appliances functioning by the end of April. The. 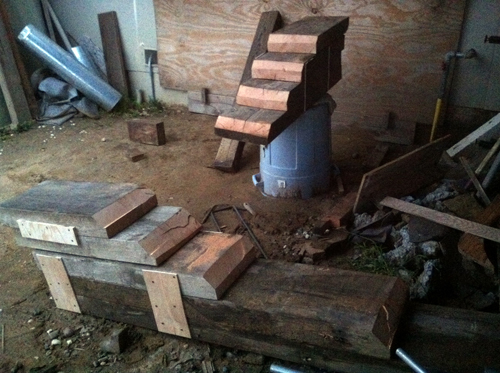 Time will come for the upstairs, there are still some questions about how that's going to come together... Here comes a really Intense month! For now I'm going to call it a day and tomorrow go to San Diego and do my taxes like a good obedient citizen. Today I did pick up our table - all done and ready for finishing touches To be done by us. It looks wonderful - Jim Sweeney is a really great guy and did a wonderful job. Now all we have to do is sand it down to 600 grit and put a few coats of oil on it and we'll have a surface worth the art that will be displayed upon it. 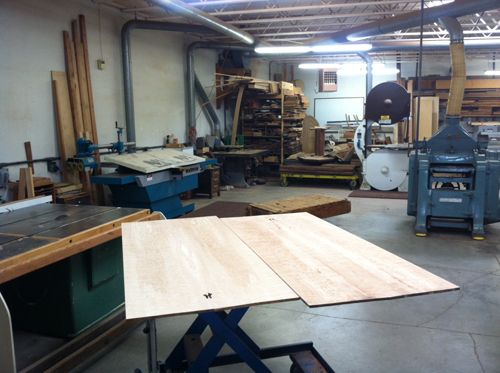 Here is a shot of the book-matched table tops awaiting being cut and one of Jim cutting the surfaces on his beautiful table saw. During the breaks I made a small frame that will hold our water heater in place in the cargo bay. Ryan cut some angled iron and thus made the fixtures that will tie the black water tank and water pump to the I-beams that run undated the bus - major pieces of metal, so we might as well make good use of them and make than carry stuff. OK, this is enough of a novel for tonight. April is going to be great! Relatively productive day. No pictures to show for it though, sorry - sometimes work gets in the way of documentation. Morning started off with finishing the closet door - sanding two part epoxy is no fun and the dust is terribly fine, so if you ever do it (and I do recommend it as it looks really cool), make sure to follow the instructions and be back in the amount of time they tell you to be back in after pouring it to wipe off the drips. Then Ryan and I went down off the hill to Home Depot and Orchard and bought the things we need to start the gas delivery system. Two of the three appliances that are gas-related are here already. We had the stove for a while, water heater arrived yesterday (slightly damaged in shipping by UPS) and I am still deciding on the type of a space heater that I would want to get. 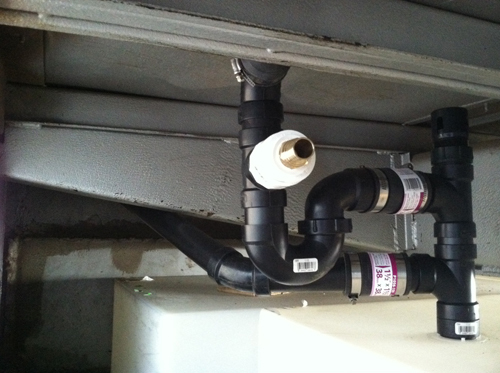 We also got the fixings to hook up our black water, so hopefully by tomorrow evening it can be installed. After we got back I sanded and put the second coat of lacquer on the counter frame to the sounds of Pink Floyd, very meditative and relaxing (or was that just the fumes from the spar varnish...?). Upon return I did a little cutting of wood and metal to prepare the parts for the black water tank installation - cutting 3/8in threaded rod is no fun, it's very loud and the vibrations are tough to deal with, but it's done. I do love working on a vertical press drill! Maybe I'll be a machinist in my next life... No, wait, by then only robots will be doing that and I don't want to be a robot! I'll be a darkroom photographer again - there will still be darkrooms in the future if Photo Palace can help it. 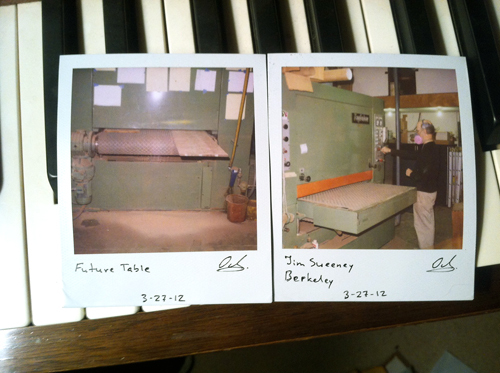 Here are two Polaroids taken today in Berkeley - Future Table and Jim Sweeney (and his incredibly cool sander). Jim is a professional through and through and he's going to bring the boards that were split by another place (which I won't mention here because they had terrible service). He will joint the boards (how many of you knew that 'joint' is also a verb? ), book-match them and cut to size. 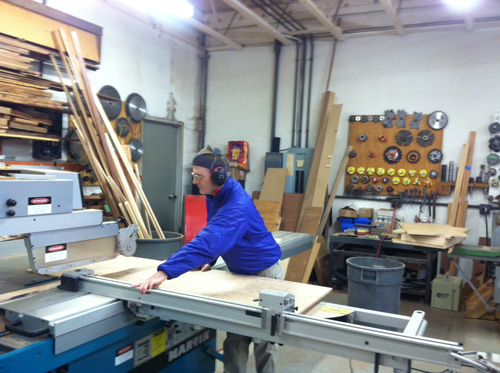 After that he is going to run them through this sander a few more times to make the tops perfect. The first image was taken as the boards were coming out of the saner and I was supposed to catch them - no better time to get my trusty Polaroid 680 out to fire off an exposure or two. And now... if you are hungry and are down in the wood shop and you put this pattern of glue on your 1x3 board - wouldn't it make you want a slice of a baguette? 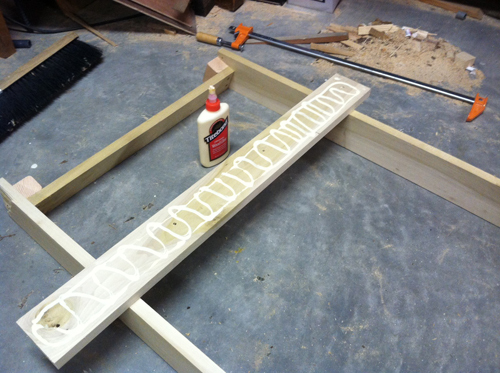 Gluing is the new black - you're either gluing or you're out of the look. I do love the process of joining wood together - almost makes me think I can bring the trees back to life. Alas - all I can do is not buy too much, recycle what I can and reuse what is around. Tomorrow is another day - hopefully the paint on the counter doesn't need another coat (it already got 4...), then I can put the first lacquer coat on. For now - let's see how those epoxy drips are going to like 60-grit sandpaper and a bit of elbow grease. I have to admit - working with clay is not exactly like riding a bicycle, it doesn't come right back. 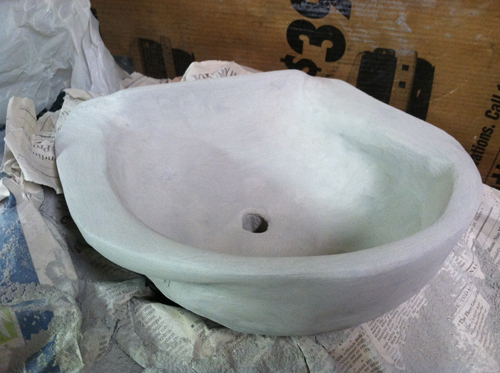 That said, here is a picture of the future bathroom sink. I'm having fun making it though - it's taking me back to 2005 and SJSU days. Perhaps I'll visit and say hi to Monica and Stan there and see how the new layout looks since they moved the kilns from the second floor out to the yard. I got to admit it was pretty crazy back in those days - over a half dozen kilns in one giant room, including raku... Being able to have buckets of flaming newspaper indoors while doing raku was especially thrilling. Too bad I can't do raku for this sink - raku is an ancient Japanese tradition of firing clay originally designed for a tea ceremony and, I guess, ceremonial tea cups that are used only once are not required to keep water, so vessels treated this way are slightly porous and will slowly seep. Great fun to do though if you like handling 1200°F with tongs. As some of the readers may still remember (after all the updates about counters and benches, and closets, and flooring, etc.) this bus will indeed contain a functional darkroom. After careful consideration a decision was made to have one enlarger set up for printing smaller formats and another one for larger formats (as well as prints larger than 16x20). We have plenty of Saunders LPL 4x5 enlargers to serve as the 'larger-enlarger', but only a few days ago I found this beautiful vintage Durst 606. I have to admit I'm rather impressed by this old Italian design. It is both very functional and extremely weird. The light come from a bulb positioned in the rear and goes through a condenser before being reflected down a mirror. The universal negative carrier has one piece of glass on the bottom and the negative is actually held down by the second condenser (!). The carrier also has masking blades built in to mask off a negative of any format from Minox to 6x6. 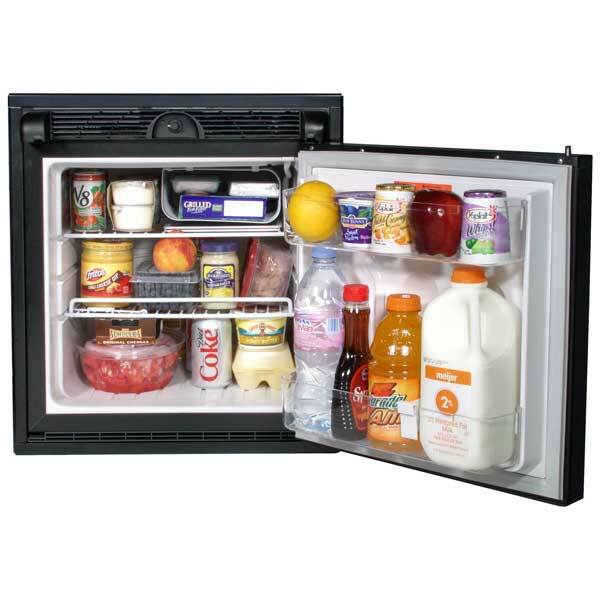 With it's compact design it is a perfect fit for our darkroom and it can produce 16x20 images from either 35 or 120. The enlarger was bought from a very nice local photographer who, after hearing my interest in testing it out set up some developer and fixer in his bathroom so I could test out the light spread and see if the minute scratches that were barely visible on the glass would show in print. 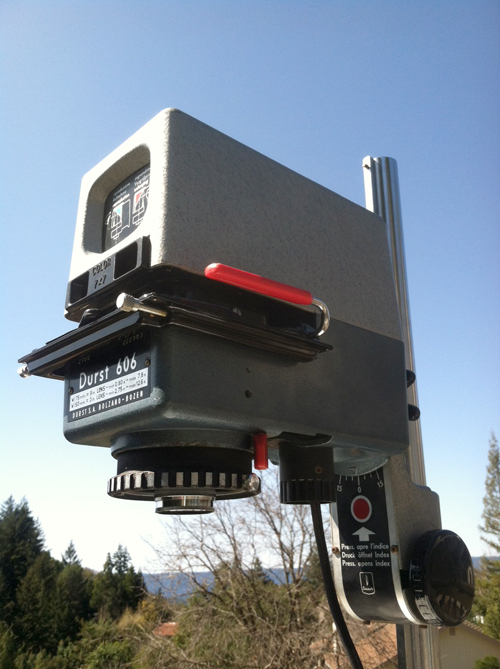 I'm glad to say that they did not and I was happy to walk out the door with a brand-new 40+ year old enlarger. I was also extra happy because with the enlarger I also was carrying a bundle of old paper that was included as a bonus in the sale. One of the boxes is extremely intriguing - 250 sheet box of 11x14in Kodak Polycontrast F in Single Weight. Can't wait to experiment with that. Now - off to the Bus to install a black water tank. Rain or shine - work has to go on. Yesterday I had a great pleasure of visiting my friend Garry Belinsky - I met him a long time ago in San Diego and he was the one who pointed out SJSU as the only state (read as 'affordable') school in CA that offers B.F.A. degrees in photography (vs. a plain simple B.A.). We moved to the Bay Area in 2003 and even were roommates for the first 6 months. He is a great photographer with a unique vision and has also made himself well known on the commercial assistant field around here. We talked darkroom most of the time and probably completely bored his girlfriend. On the way back from visiting him I picked up a few more things for The Photo Palace Bus, which were kindly delivered to San Jose from San Diego by Quynh Ha - another SJSU photo friend who happened to be going there for a short trip. She photographs cars and is planning on a brave step of uprooting herself from the Bay Area and moving somewhere for a fresh new scene. That will be exciting for her and I wish her the best. Quynh brought with her 2 40x50in gelatin silver prints that I plan on making into 4 swinging doors that will go on the front of the counter. 2-part epoxy is a wonderful (and wonderfully messy and toxic) thing. She also brought with here our black water tank that was sent to San Diego instead of Los Gatos by a careless eBay seller. Many thanks are due to Amanda Beam who helped out with getting all the stuff together for Quynh and who in general has been very supportive of The Photo Palace Bus from the get-go. Here is what our counter looks like at this point. This was all done during the rain period. The harsh lighting can be attributed to the industrial flood light that has to be used while the rain-proofing tarp is over the bus - without it our bus is the 'bus-of-perpetual-dusk'. 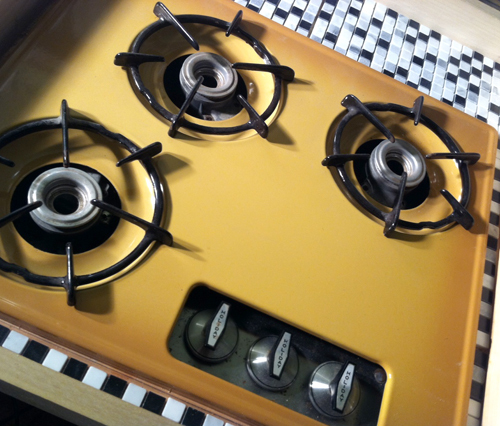 Our beautiful vintage stove (eBay bargain deal) is now in place and is waiting to be hooked up to a propane tank. Decided to surround it with black and white marble tiles to protect the wood from heat and to make it look neat. 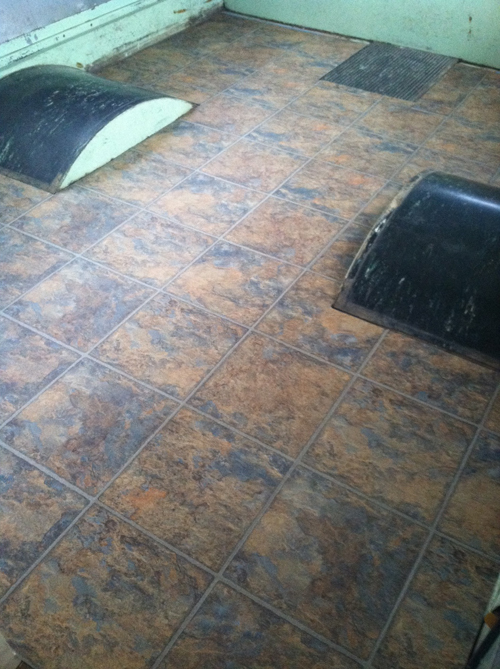 Once we make sure that the stove is working perfectly (as advertised on eBay) it will be fixed in place and the tiles will be grouted in on the bottom and on the sides of the stove enclosure. 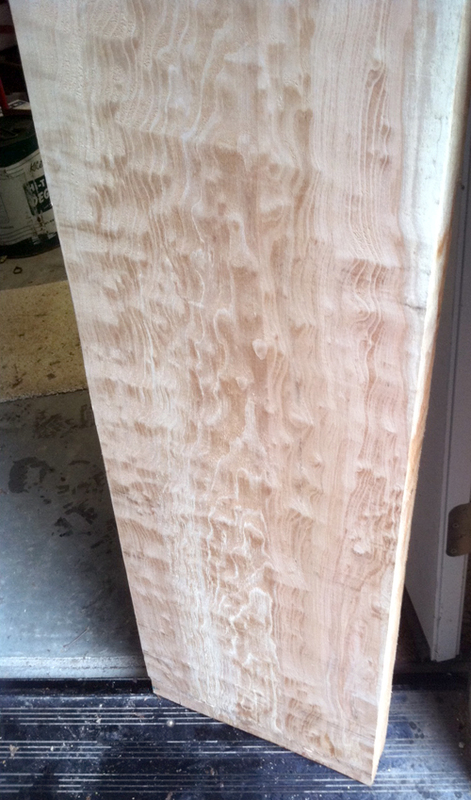 Well - I finally found the perfect piece of wood to make our 8ft counter. This single piece of flamed maple will be sliced, joined, sanded, lacquered and polished to make a surface worthy of the art I hope The Photo Palace Bus will see when it's finished. For now, it is still raining (16in+ in the past 5 days and counting) and Ryan left last night to go to Tahoe to snowboard, so the Bus and I are on our own till Monday. On the good side - epoxy is drying on the closet door, which features a 20x40in cyanotype by Ryan, and it should be ready on Sunday. Well, we have a week worth of rain in the forecast and The Photo Palace is parked on a hill so water drips down the side and into the cargo bay and through the front door. 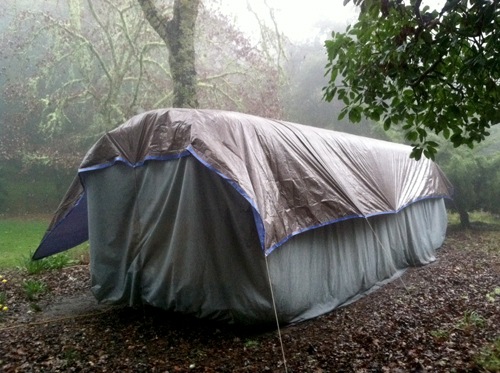 A little of that we can stand, but we didn't want to let our baby soak for a whole week so we decided to invest in a sizable tarp. It was fun putting it on with the wind blowing... We did do a short time laps photography during the process and as soon as we string it together into an MOV file I'll add it to here. For now, here's a still shot of our butterfly in its cocoon. 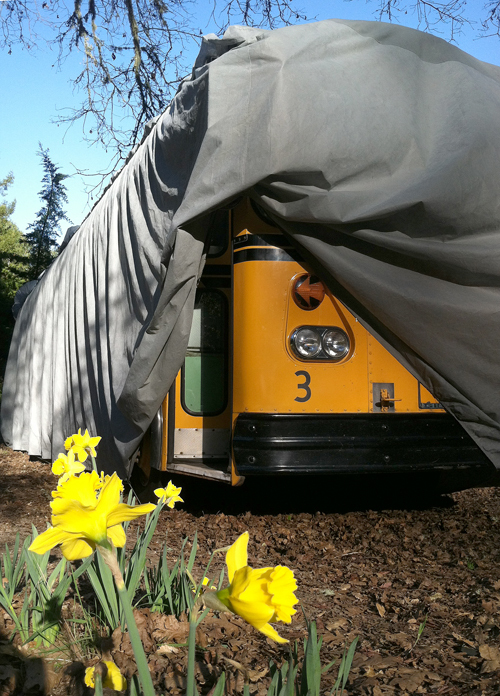 Currently the Bus is parked in a beautiful meadow in front of the house of some very kind people who are letting us work on it there. It's only about 1/2 mile from Ryan's house, so it's not too far from the shop. Last weekend the flowers bloomed around it and this week the weather is starting to be really nice and, since we are finally past the spring equinox, we are having more and more time to work on our baby. Here is how The Bus looks right now - wrapped up in it's cozy cover it really does evoke a comparison to a butterfly waiting in it's cocoon. 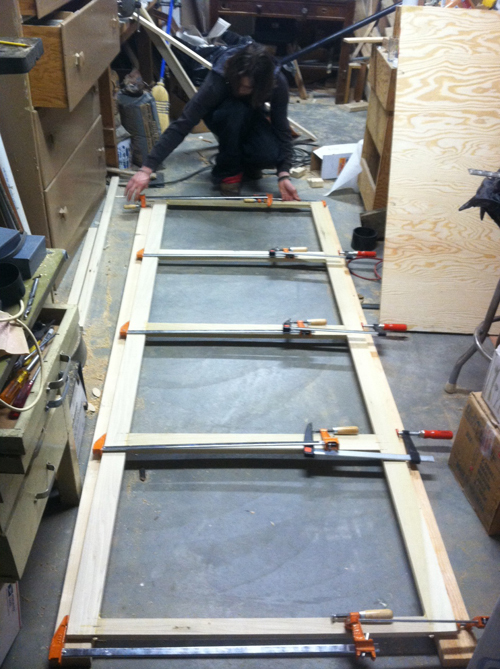 Ryan putting on the last clamp on the frame. 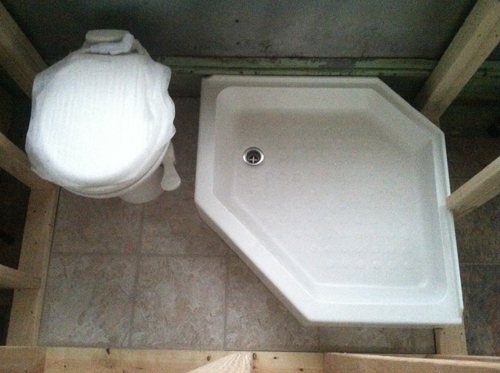 Who knew that plumbing can be such a frustrating feat! It seems that in every store we visit there are various fittings/hoses/clamps of different shapes/sizes and NONE of them fit together in the same store - half the stuff is bought in one place, half in another and another half in the third place. In case You, my dear reader, are counting, that leaves us with 50% leftover parts that end up confusing us as much as this post is confusing You. In spite of this we did manage to get the gray water system up and it's pretty much ready to be glued together and become permanent. How does it look? Makes any sense? Currently waiting on food grade hose for the fresh water. 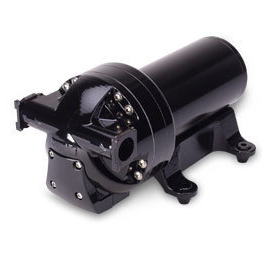 Pump will be ready for pick-up on Friday. Counter should be starting to be cut tomorrow and so are the frames to go on top of the wall structures.... Building The Photo Palace is a lot of work, but we love it! 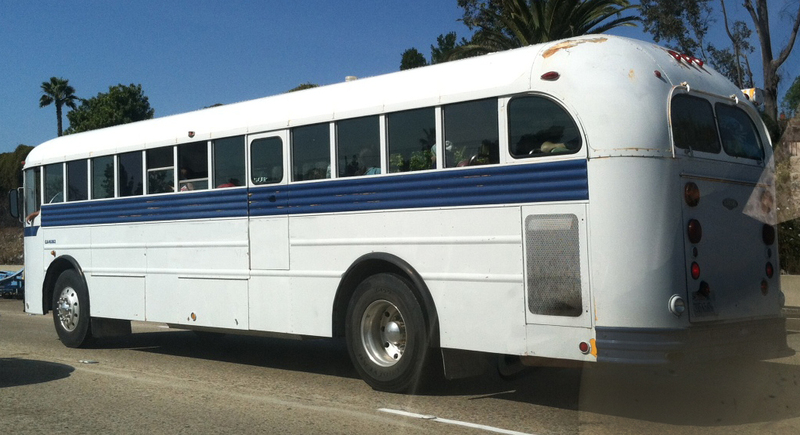 Stuck in traffic due to an accident I saw this relic - still doing it's rounds for an East San Diego County church. I think this one is a few years older than our baby, but it sounded strong. You can still see bits of School Yellow paint under the pealing Church Blue. We'll see you on the road soon buddy! A few more purchases are made + old friends come into the picture. Visiting San Diego this weekend for a couple of days while Ryan is enjoying some fresh snow in Tahoe. Last, but not least (though probably most unsightly) we purchased a perfect black water tank the picture of which I will spare you from seeing. Let's just say we are going to have plenty if refuse space, so no worries there. I was wonderfully surprised though when the first sales guy I made eye contact with upon walking in the front door raised his hands in greeting and proclaimed: "Anton! Good to see you buddy!" Turns out of all the RV places in the entire San Diego area I chose to walk into the one where Andres (a friend of mine from years back) has been working for the past year and a half. I actually remember him telling me got that job, but I did not know that it was that particular huge lot. Needless to say I had a wonderful experience poking around various RVs, asking all sorts of weird random questions to which I am sure nobody else would care to give me answers to, and getting all kinds of information on where to get custom and non-custom parts. To top it off Andres promised to help me select and order the parts through his dealership so we might (or might not) get some sort of a small discount, which will help. Next big purchases are batteries and a water heater and that's coming right up. Tomorrow night - back to the Bay Area and back to working on the Bus. 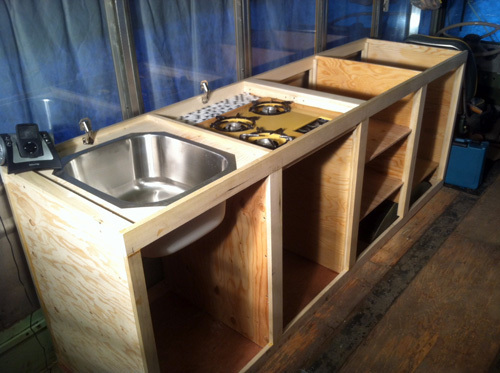 Next week - dry fit on gray water and fresh water plumbing!